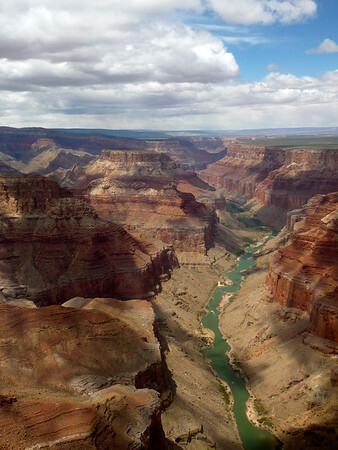 How would you love to admire a canyon as impressive as the grand canyon almost by yourself? 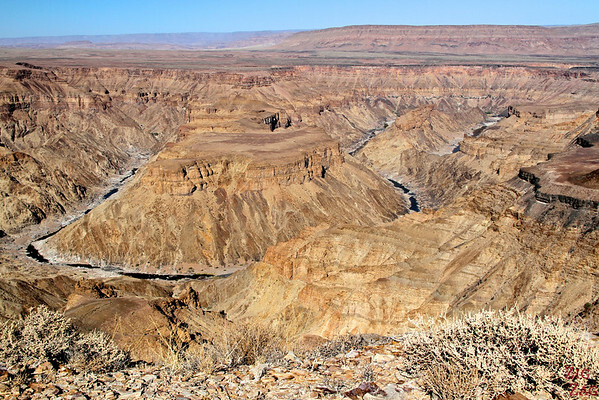 Well it is with the Fish river canyon in the South of Namibia. It is almost as wide, crazy beautiful and there are almost no tourist and only one small building. 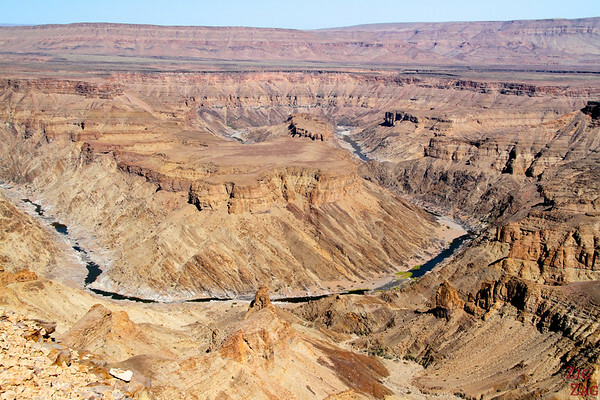 Situated in the far south of Namibia, the stunning Fish River Canyon is 550m deep and 27km wide. The gorge meanders for approximately 160km. 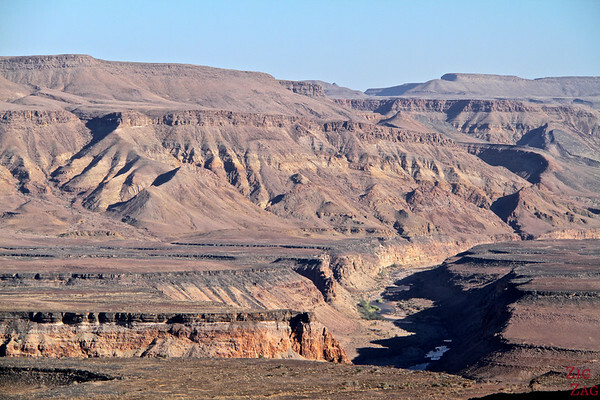 The Fish river is the longest river in Namibia and takes its source in the eastern Naukluft Mountains. It was created by water erosion and the collapse of the valley bottom due to movements in the earth’s crust. 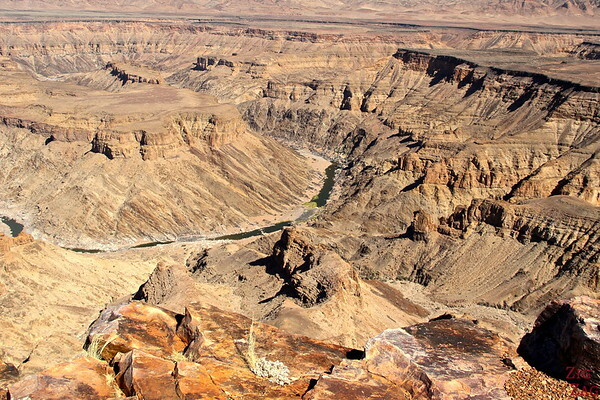 The entrance to the Fish River Canyon Park lies in Hobas, south of Keetmanshoop. The camp has a small store and a campground. From here it is 10 km to the main viewpoint. The canyon has a main viewpoint with some explanations. Then you can walk along the cliffs where there are no facilities and absolutely no trees. 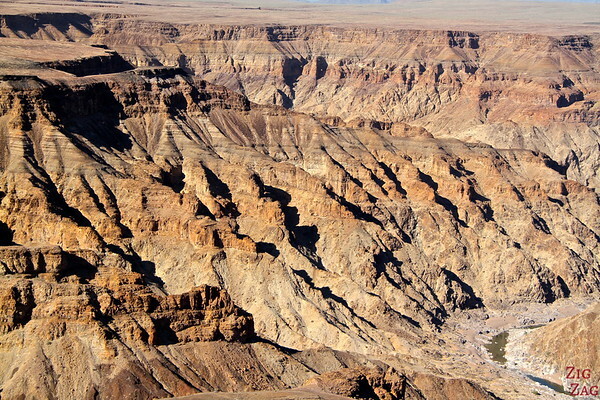 South Namibia really has it all: the biggest sand dunes and the second largest canyon on Earth. Yes, you read right. It is really in the middle of nowhere but it is the second largest as it can reach 27km wide in some places. I found it as impressive as the Grand Canyon but the comparison stops there. First of all there is absolutely no trees and no snow. And the biggest difference is the lack of tourists and tourist facilities. We arrived there early morning and were absolutely alone!!! For those who have been to the Grand Canyon, you can imagine how crazy this is. We had plenty of time to walk around and enjoy the dizzy feeling of the drop and emptiness. By the time we left, some other tourists were arriving but we are just talking a few buses. Nothing in comparison to the Grand Canyon! And just to finish convincing you this is a very special place, here are few more photos. 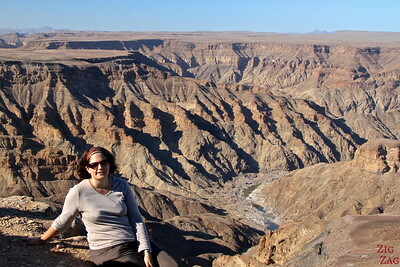 Do you understand why Fish River Canyon made it to my top 5 places to see in Namibia?